Mild Steel Louvered Grilles designed to satisfy all types of air transfer application in offices, shops, schools, hospitals and many other commercial projects. 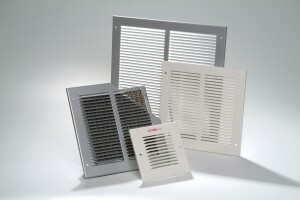 Manufactured using modern press machinery and production techniques robustly fabricated from 2Oswg mild steel and comprises of horizontal louvres set on an 8.5mm pitch with a 30% downward deflection. Suitable for surface mounting on both door and wall internal applications. The steel construction ensures that the unit is satisfactory for all standard air transfer applications, with or without a fire grille requirement. The wide flange border provws adequate clearance for fixing to the surrounding structure. Slimline and unobtrusive the unit offers a free area around 66% for economical selection and is readily available in a wide variety of normal and reverse of list sizes. Flange screw fixing using self tapping screws provided. Special Finishes available are Stove Enamel to BS or RAL colour. Also Polyester powder finish to RAL colour.